I am so excited about this month’s theme as it revolves around the earth and all things nature! 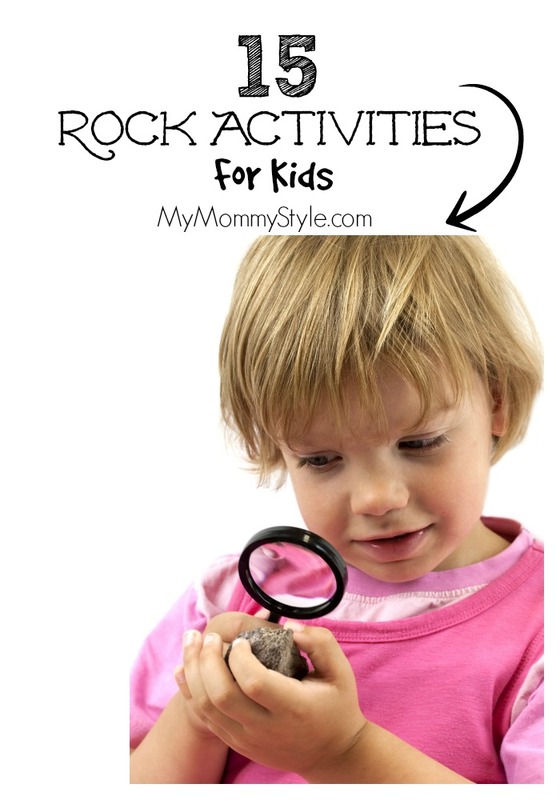 We’ve rounded up a few of our favorite rock activities for kids and plan on taking them for a walk in a couple days to gather rocks that we will be doing some activities with as well. I love this craft from Fantastic Fun and Learning and her step by step instructions on how to make your own rock! 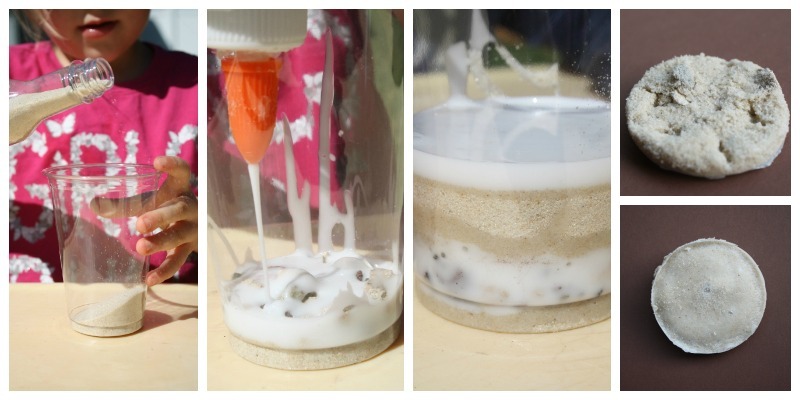 I think this is a great way for kids to learn hands on the process of a rock’s development. 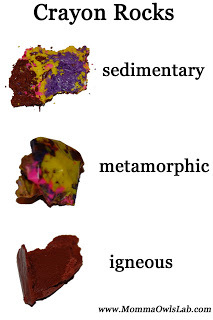 I am in love with this learning activity from Mommas owl lab of using a crayon activity to explain the different types of rocks and how they work. So visual and brilliant! I have seen a few different options of practicing the alphabet using stones and I really like this one from Buggy and Buddy. Whether you decide to gather up your own rocks or paint your own from inspirational laboratories, your kids will love having a collection that is all their own. I love the idea of encouraging my kids to be scientists, explorers, and investigators. You could create a special notebook for them to keep all of their special discoveries in like this from Carrots are Orange. I love this list that was put together by Fantastic Fun and Learning! She really knows these stories and can tell you which ones are best! Some of my favorite memories as a kid are simply being outside and discovering new rocks with different shapes and sizes. As kids my brothers and I used to create our own little “shops” were we would set up our own collection of valuables. When I say valuables I mean that they were sticks that were shaped like a gun, snail shells, rocks, flowers, etc. We had so much fun and we also added a “rock currency” of deciding how much each item was worth and exchange these items through purchasing them with our collections of pebbles. It was a game with we came up on our own and we absolutely loved it. You could create a game of actually skipping with rocks like hop scotch…but I am a sucker for simply going to a lake and skipping rocks. My Dad loved to hunt with us for flat, smooth rocks and we would practice skipping rocks for hours. My son loves to use the rocks around our house to build a little “hotel” for the bugs that live around our house. He will gather up potato bugs and put them inside of their castle. Depending on the age of your kids this could be the actual rock climbing experience or just find some big rocks to actually climb on. “If You Find a Rock tells about discovering different kinds of rocks but the classifications are different from the norm. Along the way kids are introduced to a chalk rock, a wishing rock, sifting rocks, a worry rock, a hiding rock, and more. Reading the book on its own may be a little abstract for younger preschoolers, but if you have a collection of rocks for them to hold and discuss then the book becomes a wonderful tool for learning and conversation. This is a great book to read before heading out on a nature walk. Since reading it my oldest daughter continually tells me what kind of rocks she is finding when we are out and about.” Thank you to Fantastic and Fun Learning. I had to add this movie simply because there is a rock man in it and it is a fun movie from my childhood! Find a special rock that is easy to find (depending on the age of your kids) and take turns hiding it. This could be in your house or outside. I hope these ideas inspire you for a fun week with your kids! We will post our wrap up later this week!